Our guide to Cape May will help you find the best bed and breakfasts in Cape May New Jersey. There are tons of great bed and breakfasts in the city of Cape May, our city guide will help you find the best bed and breakfasts. You may have a hard time deciding what to do in Cape May, but we make your decision easy. 1102 Lafayette St, (609) 884-8288 - The Primrose Inn offers elegant accommodations in the Historic District across from The Physic Estate and Museum. 22 Ocean St, (609) 884-1934 - Ocean views, large porch with rocking chairs, Restored 1880s Victorian, near beach and shops, delicious breakfast & afternoon refreshments. 710 Columbia Ave, (609) 884-2129 - The Bacchus Inn is the premier Cape May bed & breakfast in Cape May New Jersey close to Cape May Beaches and other great attractions in Cape May. There are plenty more bed and breakfasts in Cape May. 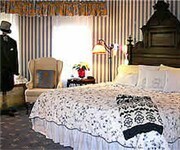 See all bed and breakfasts in Cape May New Jersey.